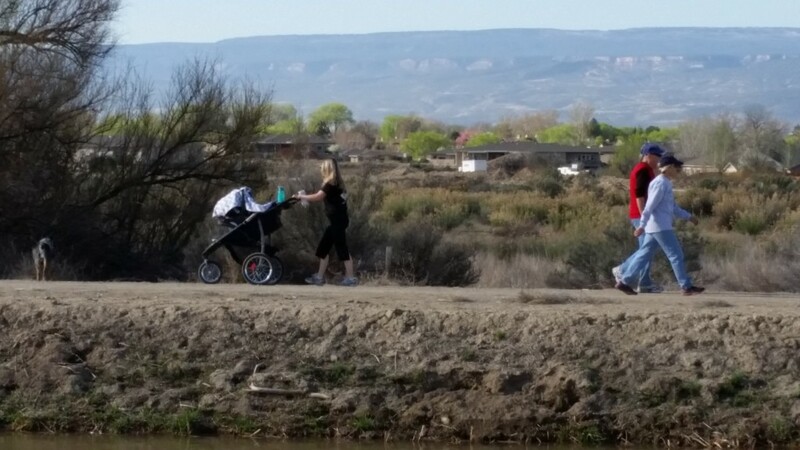 People enjoy a morning stroll along the Grand Valley Highline Canal as it fills the valley’s extensive, government-funded irrigation system with water, marking the beginning of the Grand Valley’s 2015 growing season. The Grand Valley Highline Canal, also called the Government High Line Canal, is a federally-funded irrigation project that made settlement of the Grand Valley possible. It was completed in 1917 and is 55 miles long. Technically, walking or biking on the canal banks is trespassing, but according to former three-term Mesa County Sheriff Stan Hilkey, not one single case of canal road trespassing was ever prosecuted in the valley in the 28 years served on the Sheriff Department. “Maybe someone has gotten a ticket,” said Hilkey, but basically MCSO considers it “the lowest priority misdemeanor there is.” Every farmer in the valley owes his or her living, and a big debt of gratitude, to the federal government for creating the canals.